Your Arizona roof usually doesn’t get the attention it deserves. After all, it’s a large part of your building and it protects everything inside your building from the elements. Along with protecting you, your employees, and your belongings, it also protects all of your machines, computers, and data. That’s why whether you choose tile roofing, shingle roofing, thermoplastic roofing, commercial foam roofing, or green roofing, it is important to seek out an expert roofer who can guide you in choosing the commercial roofing system that will best meet your needs. Your roofer should be experienced in both new roof installation and re-roofing. If your business is in a smaller, residential size building with a sloped roof, shingle roofing in Avondale can be a great choice. Most roofers offer roofing shingles in a wide array of colors and styles. Some roofing shingles are specifically designed for specific client needs, such as to resist heat, wind, or hail. Most shingles are warranted for 20 to 30 years. Shingle roofing is often the least costly option for new roof installation. Tile roofing in Avondale is another popular choice for a sloped roof. Clay tile is especially well liked in the southwestern style many Arizona buildings use. A beautiful tile roof can set the style for the entire building. Tile roofing is also available in a wide array of materials, styles, and colors. In the past, you often couldn’t use tiles for re-roofing because the tiles were too heavy for the roof’s structural support. Today that’s no longer true. New lightweight materials now allow tiles to be placed on most buildings. Metal roofs have been commonly used on commercial buildings for decades. Metal roofing systems consist of mechanically fastened metal panels. The advantages of metal roofing include strength, weather resistance, fire resistance, and durability. They are attractive and are available in a variety of colors. Furthermore, they reflect heat and sunlight so they will help save on cooling costs. Thermoplastic Roofing, known as TPO, is quickly becoming the most popular type of commercial roofing system in Avondale, Arizona. It is made of an extremely durable material that is flexible even at low temperatures ,but can also tolerate extremely high temperatures. Thermoplastic roofing is also resistant to chemicals, ultraviolet light, high winds, and even fire. It offers a lifespan of over 20 years. Foam roofing has quickly become another of the most popular commercial roofing types. When the foam is applied it is a liquid, making it able to flow into every crack and crevice. As it dries it forms a uniform solid surface, drying snugly around chimneys and vents. When applied by an experienced professional, a foam roof will protect against ultraviolet light and make the building more energy efficient. Another plus is that the foam can be applied over some existing roofs, so when you’re building needs to be re-roofed in Avondale you can avoid the time and cost of stripping off the old roof. In addition, foam is perfect for flat roofs as it forms a watertight seal. It cannot be used on roofs with much pitch since it is applied as a liquid, there would be a problem with it dripping off before it dried. If properly maintained, foam roofing can last over 50 years. EPDM roofing consists of a synthetic rubber roofing material made from a mixture of ethylene and propylene. It’s the longest lasting type of commercial roof available. EPDM commercial roofing systems are fairly easy to install, repair, and maintain. It’s versatile, low maintenance and practically indestructible. A modified bitumen roof consists of asphalt and fiberglass. This is a durable roof that is not easily damaged. Commercial roofs are often where the heating and air-conditioning unit is located, among other things. The fact that modified bitumen won’t be damaged by maintenance workers walking on it, and it will not crack or tear, makes it ideal for commercial roofing. Photovoltaic solar panels or PV panels are an eco- friendly addition to a roof. PV solar panels can be installed over a roof to absorb sunlight and convert it to energy resulting in lower utility bills for that building, along with a smaller carbon footprint. You can’t get more eco-friendly than a green roof. Over the last few years green roofs have experienced the greatest upswing in popularity of all the commercial roofing types. This innovative roofing system consists of a flat roof that is partially or completely covered with vegetation and soil, all planted over a waterproof membrane. The benefits of a green roof include the fact that it greatly improves the roof’s insulation, saving money on utility bills, as well as reducing the urban heat island effect by soaking up heat. As if that isn’t enough, the plants also help purify the air. Whatever commercial roofing type you choose, it’s essential that is installed correctly. The professional Avondale roofers at Arizona Roof Rescue are experienced in working with all types of roofing materials. Our NATE Certified roofers are skilled at new roof installation, re-roofing, and repairing all types of roofs in Avondale. In addition, Arizona Roof Rescue is fully licensed, bonded and insured. 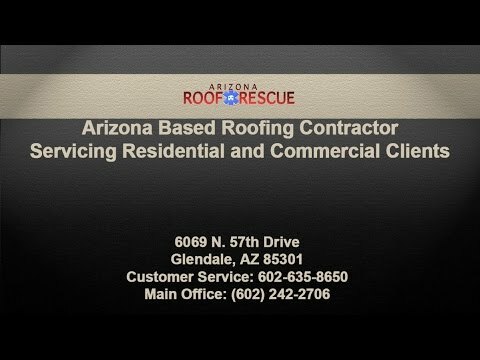 Arizona Roof Rescue is a full service Arizona roofing company that has been in business for over 40 years. We have great reviews on both the Better Business Bureau and Home Advisor sites, along with hundreds of satisfied customers who return to us any time they need help with their roof.